There is nothing more debilitating than the natural human fear of the unknown. For example, the fear that sets in when you realize that you hadn’t known today was you and your girlfriend’s fourth year anniversary. What’s worse, if you’re anything like the typical guy, as you scramble to play off this temporary lapse of knowledge by running to the nearest flower shop, you are completely at the mercy of the staff. Will it be one of those musty old shops that just throws a handful of cheesy glitter on some roses, charges you 50 bucks and sends you off? Will the staff only speak broken English and think you’re trying to buy an arrangement for a funeral? Would you even know the difference?!?! All I can say is thank your lucky stars if you find yourself in this scenario and end up in Princess Flowers in La Crescenta, with owner Diana Arakelyan and her staff. For Diana is not only an experienced flower arranger with one of the most artful and elegant eyes in the business, she is also a true professional. Though Princess bustles during the regular floral-heavy holidays such as Valentines Day and Mother’s Day, you can count on her shop to be kept fresh the whole year round—she does tons of wedding, funeral and large party arrangements throughout the seasons in addition to the typical walk-in business. Princess is so good, they even outfit corporate businesses such as restaurants and fine hotels with consistent deliveries that regularly freshen up their natural décor in lobbies and gathering areas. So put away your fears by placing your floral livelihood into the skilled hands of Diana and her crew… she’ll brighten up your wedding or event, or maybe even save your relationship to begin with. 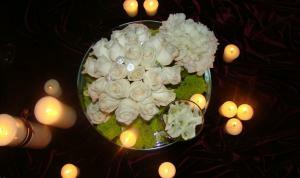 Pluses: Full arrangements for weddings, large parties and banquets including corporate programs for regular deliveries. Tons of designs for single-serving occasions. Always heavily-staffed and bustling on the major flower holidays.